2.3.3 Warp In, Warp Out! Having a student be responsible for handling the linking of modules and ships is very handy in this class. It is a long class, so having the extra pair of hands will pay off in the long run. Also, it isn't a bad idea to offer a 5-10 minute break halfway through the class to give people a chance to stretch their legs. This class can also be split up into two separate classes. You can stop the class after discussing basic ECM strategy and the sample Blackbird fitting, which should take about an hour, and schedule a second class at another time to cover the advanced topics. This class was originally designed as a single course, however, and does function best in that manner. Welcome to this class on Electronic Counter Measures, commonly known as ECM or Jamming! This course is designed primarily for students who want to an in-depth analysis of how ECM works and how best to utilize this specific type of electronic warfare. Over the two hours or so, we shall cover the broad topic of ECM, focusing on it's use with the three tech 1 ships optimized for it's use. We will not be covering the tech two ships, nor shall we be covering the use of ECM within wormhole or null sec specific situations. There will be math involved in this class, but we'll try to keep it to a minimum. Everyone ready? OK, then - let's begin. ECM is a form of Electronic Warfare that the Caldari specialize in that prevents another ship from obtaining a target lock on any object in space. Commonly known as "jamming", a pilot who is jammed cannot target any gates, POS modules, or most importantly, any other ship. However, unlike all other forms of electronic warfare, ECM is based purely on probability, making it subject to the whims of chance. ECM pilots are often early primary targets in fleet battles. While you should always have an up-to-date clone in EVE, it is even more important for ECM pilots due to the high probability of people trying to blow their ships up. All of the ECM bonused ships are Caldari in origin. In order to fly them, a pilot will need to train up their Caldari ship skills. These ships all offer significant bonuses to ECM modules in a variety of ways, and should be considered the best choices available for ECM work. Caldari ships, specifically the Griffin, Blackbird, and Scorpion, receive bonuses to jammer strength, capacitor usage, and other attributes. Because of the probability-based nature of ECM, use of the properly bonused ship is strongly recommended. The use of a non-bonused ship significantly decreases the effectiveness of the ECM modules and should, in general, be avoided. It is recommended that you have a minimum ship skill of 3 before flying the ship into a combat situation. This skill is required to use the various ECM modules. It reduces the capacitor need for ECM modules by 5% per level. It is recommended to train this skill to a minimum of 4, as it is critical in unlocking tech 2 modules and in unlocking other ECM-related skills. This skill will require you to already have Electronic Warfare skilled up to level 2. It grants a 10% bonus to the falloff of all ECM modules per level of skill. It will also impact Remote Sensor Dampeners, Tracking Disruptors, and Target Painters in the same way. This skill will require you to already have Electronic Warfare skilled up to level 3. It will grant you a 10% bonus to your ECM optimal range per level. When this skill is combined with a high skill of Frequency Modulation, it will allow you to dictate range much more easily. It will also impact Remote Sensor Dampeners, Tracking Disruptors, and Target Painters in the same way. This skill will require you to already have Electronic Warfare skilled up to level 4. It will grant you a 5% bonus to your jamming strength per level. This is one of the most critical skills for a dedicated ECM pilot to learn, as aside from module bonuses and ship bonuses, it is the only way to increase your probability of successfully jamming another pilot. This skill will require you to already have Electronic Warfare skilled up to level 4. It is required to operate ECM drones, which come in small, medium, and large varieties. Small drones require the skill at level 1. Medium drones require level 2. Finally, heavy drones require level 3. Your skills, ship skills, and modules do not impact the jamming strength of your ECM drones, making them excellent to place in non-ECM bonused ships. In addition, each level of this skill increases your overall drone operating range by 3,000 meters. This skill will require you to already have Jury Rigging skilled up to level 3. It will allow you to fit a variety of electronics-based rigs to your ship, specifically a pair specialized for ECM. Each level reduces the potency of a rig's drawback by 10% per level. ECM Jammers are mid-slot items that are manually activated by the pilot on the ship they are targeting. If successful, the jammer will prevent the other ship from locking any other target for 20 seconds. ECM Jammers can be broken into two types: Multispectral and Racial. Multispectral jammers have the same base strength against any ship in the game. Their base strength, depending on the meta-level of the module, will range from 2.0 - 2.4 before ship skills and player skills are factored in. They also have a lower optimal and falloff range than their racial cousins. In most ship loadouts, the use of multispectrals is considered sub-optimal due to their weaker strength and decreased range. Racial jammers are split into four different sub-classes of jammers. Each one works more effectively against a specific racial ship. The off-race strength, however, is significantly less effective than the on-race. The on-race strengths range from 3.0 - 3.6 while the off-race module strength ranges from 1.0 - 1.2. Racial jammers also have greater range than multispectral jammers. Signal Distortion Amplifiers are low-slot items that increase the strength and range of the ECM modules fitted to the ship. This type of module is the only module that will increase the strength of an ECM module. A minimum of one Signal Distortion Amplifier should almost always be fitted to an ECM-focused ship, with two or three of them preferred. They range in strength from a 5% bonus to 10% bonus. They do have stacking penalties associated with them. The Particle Dispersion Augmentor is a rig that will increase your ECM strength. It's bonuses do stack with the Signal Distortion Amplifier, so it has minimal impact if a ship is already fitted with three Signal Distortion Amplifiers. The tech 1 Particle Dispersion Augmentors increase ECM strength by 10%. The rarely used tech 2 version of the rig increases the strength by 15%. As with all rigs, the tech 2 version is generally not used due to the extreme price difference. The drawback is that it reduces shields by 10%. The Particle Dispersion Projector is a rig that will increase the optimal range of all ECM modules on a ship. It increases the optimal by 20% with the tech 1 and by 25% with the tech 2 version. It also improves optimal for Remote Sensor Dampeners, Tracking Disruptors, and Target Painters. Like the Particle Dispersion Augmentor, it reduces shield strength by 10% as it's base drawback. It used to be there were specific modules to help guard against ECM. Now that has been changed as of 4/13/2016 to ECCM scripts for use with Sensor Booster modules in order to reduces the chance of becoming jammed by ECM. There are a few standard strategies when working with an ECM ship. The focus in this portion of the class will explain to students how ECM ships work in combat and some standard fitting advice common across all ECM ships. For ECM ships, the mid-slots are the primary slots that the pilot needs to be focused on. The mid-slots are where the ECM jammers are fit, so the number of slots you have available will be crucial. In addition, sensor boosters, afterburners, and MWDs all fit in the mid-slots, as do most shield tank modules. A standard way to fit most ECM ships is by using the 4 mid-slot "Rainbow" setup. This consists of 1 racial jammer from each race occupying a midslot. This works well in both the Blackbird and the Scorpion, due to their high number of mid-slots. With a Griffin, due to it only having 4 mid-slots, a compromise is often needed. With any spare mid-slots that a pilot has, it is recommended that either an afterburner or MWD be placed in one of the spare slots as a very early priority. This allows a pilot to dictate range more easily (if they do not have bookmarks in the area). Afterburners are sometimes preferred over MWDs to avoid increasing signature radius. A sensor booster is often useful to enhance pilot locking distance (if optimal of the ECM jammers exceeds their targeting range) or to increase the locking speed of the ship. It is generally not advised to fit a sensor booster to increase the targeting range for the purpose of DPS, however. That slot is better used for another ECM module due to the very small amount of DPS ECM ships do. For situations where a ship does not have more than 4 mid-slots, it is often advantageous to drop a single jammer and replace it with an afterburner or MWD (depending on situation and pilot skill). This is primarily limited to the Griffin frigate. The need to be able to burn away from a gate or tackler outweighs, in many cases, the need for 4 jammers. It is often recommended that the Gallente racial jammer be the dropped jammer. This is due to many Gallente ships being drone boats that do not need to target an enemy to attack. The low slots, like most Caldari ships, tend to be the fewest available on a particular ship. A Signal Distortion Amplifier should almost always occupy at least 1 low slot, and ideally 2 or 3 of them should be fit to a ship. However, the Blackbird only has a pair of low slots while a Scorpion has 4. The Griffin has but a single low slot. Since the low slots are often where the token armor tank of an ECM ship is located, a balance must be struck between tank and ECM bonus. For large fleet battles work, ECM ships can often get away with not fitting tank modules on the Blackbird or Griffin. This is due to the fact that if the ECM is primaried, the ship will often be destroyed in the first volley of attacks. If they are not primaried, the ECM ships have a stronger chance of getting a lock on an enemy ship and jamming the enemies. The Scorpion, with it's 4 slots, can often fit 2 or 3 Signal Distortion Amplifiers and still fit a 1600mm armor plate and/or Damage Control Unit. For smaller gangs where the intent is to go against a smaller number of foes, placing a tank on a Blackbird grows in usefulness due to the difficulty in the enemy alpha-striking the Blackbird. A 1600mm armor plate or a Damage Control Unit are generally advised as the tanking options for a Blackbird. In some cases, such as the Blackbird being the single ECM or even Electronic Warfare ship, foregoing the Signal Distortion Amplifier and fitting both is often considered a good idea, despite the loss of jammer strength. The high slots on an ECM ship are generally considered the last thing a pilot should worry about. Generally, placing missile launchers in those slots (since they don't use cap and are the Caldari weapon of choice) is considered optimal. There are some utility mods that can be placed there as well (a salvager, tractor beam, or energy neutralizers), but these needs will vary depending on the makeup of the fleet. Sometimes rocket launchers are preferred as a defense against drones. Most ECM ships are typically not used in a front line damage dealer combat role. In the heat of the moment, it is easy to focus on the biggest threat and place all of a ship's jammers on a single target. This is considered a poor plan for ECM ships. This is due to the fact that ECM is an all-or-nothing form of electronic warfare. Having five jammers all succeed in jamming a single target at the same time is equally effective as having a single jammer or a hundred jammers succeeding in jamming the target. Instead, it is best to attempt a single jam on a target. If the jam is successful, the ECM pilot can work on jamming other targets of opportunity. After 20 seconds, the jammer will attempt to jam the same target again. If successful, the target will still be jammed by that single jammer. If the first attempt at jamming fails, the pilot can then attempt to jam with their second jammer. If that one fails, they can try with another jammer. Once a jammer succeeds, the other jammers can be deactivated and used on another foe. Alternatively, they can be held in reserve in case a jam fails or more enemies arrive. This method will preserve capacitor and allow the ECM pilot more flexibility in target selection. Most experienced ECM pilots utilize their jammers in this or in another similar method, so it is one that any serious ECM pilot should be familiar with. Since ECM ships are often considered primary targets, it is crucial for ECM ships to know when to warp in and warp out of a situation. It is ideal for ECM ships to always be aligned to a celestial object (but not a moon due to the possibility of a hostile POS) during a fight. This will allow an ECM ship that is being primaried to warp in and out of combat quickly and hopefully avoid a lossmail. In addition, if a gate camp is going to be set up for a significant period of time, a fleet commander may allow the ECM ships to bounce to their optimal range instead of sitting on the gate itself. If a group of pilots regularly flies in a particular area, it is wise for an ECM pilot to begin to obtain bookmarks for the gates, asteroid belts, and other locations they frequently roam in. This can allow an ECM pilot to quickly warp to their ideal range instead of having to bounce, saving them a step in a fight. In the event their optimal range is less than 150km from their current position, having bookmarks a minimum of 150km from the celestial object (gate, planet, belt, etc...) will allow the pilot to warp to that location at range, potentially putting them within their optimal regardless. The process of creating bookmarks and the optimal way to do that is, however, the subject of another class and will not be covered by this course. At this point, the teacher can walk the students through a simple Blackbird fit. Options from the earlier discussion can be discussed, including adding a 1600mm armor plate and utility high slots. This is meant to be a review to solidify the basic fitting methodology for ECM ships in the minds of students. The fit below is the same one as in the ECM Guide to provide consistency in teaching. There are several more advanced ECM strategies to consider when examining ECM. What we're going to do now is go over some of the more helpful ones and also present some alternate options available to pilots. This is not meant to always tell a person what the best option is out there, but to rather present existing strategies that are known to be helpful to pilots that may assist them in their use of ECM. Perhaps one of the most simple but effective strategies for ECM pilots is to take a minute to remap the locations of your ECM modules. Every single ship can have the button keyed to a module altered. As ECM ships "attack" primarily with their jammers, it stands to reason that having the jammers mapped to F1-F8 is a very efficient way of keeping your primary weapons available quickly. In order to do this remap, your ship should be in space. Hold down the SHIFT key and then click on a module. You can then drag it over to the location you want it to be. You can even drop it on top of an existing module and they will switch spots. You can also do this with tank modules, propulsion modules, or anything you like, really. The use of sensor boosters, in the past, was almost exclusively for their ability to boost the targeting range of a ship. However, as ECM modules now are often already within the targeting range of a ship, the use of resolution scripts to improve locking time has become a viable strategy. The main benefit of resolution scripts is that it allows a pilot to lock onto a ship faster. This can be crucial against frigate-sized vessels and also against enemy electronic warfare ships. If your ECM ship can jam their ECM first, then their ship has just become useless. Faster locking can help with this. In addition, if the enemy is using Remote Sensor Dampeners on you, having the ability to boost your range can be vital in being useful to the fleet. If you have a spare midslot, it is worth considering using it for a sensor booster, even if you don't need the ability to switch it to targeting range. The ability to defend against dampeners plus the ability to improve your locking time can be vital in the right situation. Overheating your jammers (or any other module) requires the Thermodynamics skill to be trained up. Once you train up the skill, you can then choose to overheat your jammer to increase the jammer strength. Overheating an ECM module increases it's jamming strength by 20%, but it causes damage to the module itself. Over time, the module will burn out and be useless until you are able to repair it at a station. Overheating ECM modules does not increase optimal range, it should be noted, just the overall strength. The more modules you overheat at once, the faster damage is done to the module and those surrounding it as damage radiates out from overheating it. Overheating too many modules at once can cause you to lose the ability to jam if you are not careful! By overheating modules that are not physically adjacent to each other on the rack, you can lessen the damage done as the damage bleeds over to other modules. You can purchase Nanite Paste to use to repair your modules in space, or you can dock up and repair them at a station with repair facilities. On a Blackbird built with four jammers, a MWD, and a Sensor Booster, an "all level V" EFT character can raise their racial jamming strength from 9.4 to 10.85 by overheating their modules. A single jammer can overheat for 7 minutes and 20 seconds before burning out. Running two non-adjacent jammers at once will burn them out in 4 minutes and 20 seconds. If there is a single module between the jammers, that module will also burn out in 4 minutes and 20 seconds. You can test your own setups with your character stats in EFT by right clicking on the green check mark in EFT to see how overheating affects your setup. Overheating is a potent weapon, but something that needs to be practiced and refined to use properly. The Bait Scorpion has been around for ages. It can be used as a bait ship and fit with an incredible tank due to it's 8 mid-slots and 4 low slots. By placing a token jammer and tackle gear on the Scorpion, it can do a great job as a bait ship. The downside is that a Bait Scorpion is a well-known tactic, and combined with the fact that a solo Scorpion is either the sign of a very uneducated player or a trap, many opponents will avoid it. However, the reverse is true that if you ever encounter a solo Scorpion, it is probably bait. Keeping a set of spare jammers in your hold can be helpful. This will allow you to, if intel comes in about a specific group of targets, dock in a station and refit to a more optimal fit. 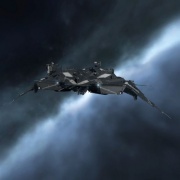 If you were to determine that there was a gang you wanted to engage that had mostly Caldari ships with a couple Amarr, switching to several Caldari jammers and a couple Amarr would be more efficient than flying with either a Rainbow setup or with Multispectral jammers. Not all fleet commanders are willing to dock up for a refit, however. This is a situational advantage, and sometimes fleet speed trumps optimal jamming choices. Above all else, the pilot must respect the wishes of the fleet commander and their squad commanders when requesting this option. Due to the very low base numbers (Multispectrals being at most 2.4 strength) and not getting ECM bonuses from the ships, fitting ECM to non-bonused ships is not recommended. Your probability to jam anyone drops drastically and your ship could be used far better in the role(s) it was meant for. Being aware of what types of ships base their DPS off their drone damage is crucial to avoiding a wasted jammer. While many drone ships have some turret-based DPS, there are often better choices to jam. For example, if a Dominix and a Megathron are both enemy combatants, jamming the turret-based Megathron will reduce far more jammers than the drone-based Dominix. Some drone ships, however, are used in Remote Repping chains, and should be jammed if this is the case. The above Dominix, for example, is often used in RR BS chains. There are many different theories on target selection for ECM ships. Circumstances often dictate the best choice for who to jam in a particular fight. Some Fleet commanders may call ECM or Electronic Warfare targets, but most do not. In this case, it is important to have an idea of what to jam first. We will first cover a couple specific situations and then get into general target selection. Jamming the enemy that has been called primary and has already aggressed the fleet is possibly a bad idea. This is because the timer for them to redock starts, and it is possible that they can use this to their advantage to dock before the fleet can destroy their ship if they have a sufficient buffer. Instead, it is better to fire your meager DPS at this foe and focus on jamming any support ships the enemy has on the field. The same philosphy as with fighting at a station applies here, except they just have a timer to jump through the gate instead of docking. This isn't as big of a deal if you have fleetmates on the other side to catch him when he jumps through, however, and if they are a significant damage dealer, it may be better to jam them and force them onto the other side of the gate for the rest of the fleet to destroy. Logistics ships: These are T2 cruisers that exist purely for the purpose of fixing other ships. They have high sensor strengths and are often the backbone of many advanced fleets. Jamming one or two of these ships can turn the tables on an entire fight. Electronic Warfare ships: If you use ECM and Electronic Warfare, your enemy might, too. Jamming their ECM should be a priority, and jamming their other Electronic Warfare can be helpful, too. Remote Repping Battleships: The Dominix is notorious for this. Gangs of battleships which don't have a lot of local tank but are all remote repping each other can be incredibly difficult to take down. They often fit ECCM to make it harder to jam them. Just like logistics ships, jamming one or two of these can make your fleet a lot more likely to win. Damage Dealers: When all else fails, focus on the big damage dealing ships. Battlecruisers and Battleships are the obvious targets here, though tech 2 cruisers and frigates are also very viable targets for your jams. With regards to the ship called Primary, if you have a large gang, jamming the Primary is not always a good idea. This is because with all the damage being done to it, you're tying up a jammer for 1-3 jam cycles. That jammer can be put to good use dealing with the rest of the fleet that is not already doomed to an explosive death. If there are only 1 or 2 ships your group if fighting, then jamming the Primary makes sense. However, if fighting a larger gang, then jamming the Primary is far less effective than it otherwise could be. The average sensor strength of ships, which is the statistic used to defend against ECM, varies based on ship size and race. Frigates and Cruisers are easier to jam than Battlecruisers and Battleships. Knowing who is easiest and weakest to jam can influence your jamming decisions, so it is worth being aware of. The Minmatar have the weakest defense against ECM, followed by the Amarr. The Gallente are the second hardest while, unsurprisingly, the Caldari have the biggest sensor strength, on average, against ECM. Unsurprisingly, the enemy will frequently try to eliminate the ECM ships as quickly as possible, either by destroying them or by neutralizing their effect on the battlefield. There are a few different methods that a gang can try to protect itself from ECM. ECCM is the most common method of protecting against ECM. These Sensor Booster scripts will increase a ship's defense against ECM-based attacks. This makes it harder, though not impossible, for jams to succeed. This strategy is seen most often in RR Battleship gangs and on tech 2 Logistics ships. There is nothing directly an ECM pilot can do against this tactic. An ECM pilot can choose to attempt to jam another target if it is determined that ECCM is making it too difficult, but that will not solve the problem of jamming that particular ship. More jammers can be dedicated to jamming the ECCM-using ship, increasing the probability of a successful jam. This takes up more resources, but is sometimes necessary. Some fleets will use Remote Sensor Dampeners to keep ECM ships from staying too far out of range or to prevent them from locking onto their fleet. The strategy is usually to either keep the ECM ships close enough for the rest of the fleet to kill them quickly with high-damage dealing ships or to make the ECM a non-factor by keeping them out of the range of the fight. A MWD or Afterburner can get your ship back into jamming range. Once you are within range, you can jam the ship that is reducing your targeting range. A sensor booster, either unscripted or with a range script, is a direct counter to a sensor dampener. If they have more than one module on your ship, it won't get you all the back to your original range, but it will make it easier. This is a straight-up ECM fight. Whoever lands the jams on the opposing ECM ships gains a significant advantage. Sensor Boosters with ECCM and scan resolution scripts can keep you from being jammed and make you lock onto your opponent faster. Frigate and Cruiser-sized ECM ships often don't have much of a tank. By sending a swarm of interceptors and fast frigates after the ECM boats, an enemy can attempt to destroy the ECM ship before it can do much damage. Warping out and to a different point in the battle is a method of dealing with this type of attack. It does take you off the battlefield for part of the fight though, which is at the least a partial victory for the enemy's tactics. If there are only a couple small ships charging your ECM ship, you can try to destroy them if you have a drone bay or you can try to jam them. Be aware that targeting these ships will take longer than most due to their small signature radius. The core thing to understand about ECM jamming is that the success and failure of a jam is not dependent on the success or failure of another module. You cannot simply add the percentage chance to jam of all your modules together to figure out your chance to jam a target. In order to determine the chance of a single jammer successfully jamming an enemy, you need to divide your jammer strength by their sensor strength. The easiest way to determine your chance of jamming an enemy with multiple jammers dedicated to them is actually to determine the failure rate first. The reason for this is that in order for a pilot to not jam a target, they must miss with every jam placed on the target. Therefore, by exercising probability math, we can multiply all the failure rates together to determine the overall chance of complete failure. We then subtract that from 100% in order to determine our probability of jamming with at least 1 jammer. The formula for determining overall probability of failure: (Failure Rate 1 x Failure Rate 2 by Failure Rate 3) x 100%. Ship Sensor Strength: 10. Jammer A Strength: 5. Jammer B, C, and D Strength: 2. Shortcut: You can also do .5 * (.8^3) to determine the rate. 100% - 25.6% = 74.4% chance of jamming success!